This week instead of a tip or trick I’d like to remind everyone about avoiding “Phishing Scams”. These scams target a huge percentage of internet users in an attempt to gain account information, be it email, shopping or banking accounts. The most recent example of this is aimed at Gmail users. 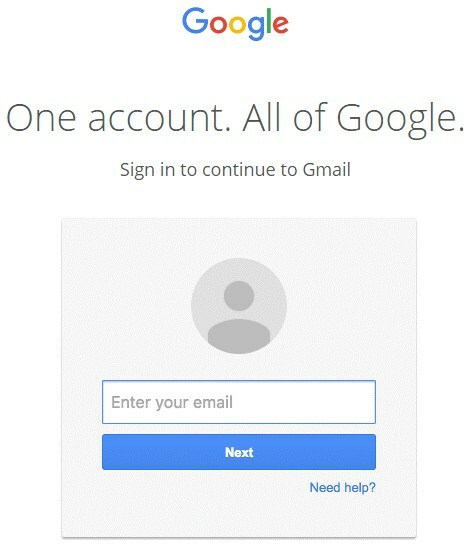 This arrives as what looks like an attachment and when you click on it instead of opening the attachment it opens what looks like the authentic Gmail login page. Here is a “good” location! The attackers signing in to the account happens very quickly and it may be automated. Since CESD does not use Gmail as our email we’re not as vulnerable to this specific attack as some organizations, but we do regularly see phishing emails of this type coming in to our system. Our email filter does a very good job of detecting and blocking these but it is never going to be 100% effective. The Technology Department will never send you a random email asking for your password or asking you to update your information. If we’re working with you on a problem we may ask, but you always have the option of just asking us to reset your password so we can access your account that way, then allow you to select a new one. For web browsing we always tell you to check the location in your address bar to verify you’re in the correct place. In the attack above that looks almost correct and most people probably wouldn’t notice it’s not right. When signing in to any service you need to verify the protocol (leading https:// or http://) and the hostname (the first part of the address). In this case you want to make sure there is nothing before the hostname accounts.google.com other than ‘https://’ and the lock symbol. If you can’t verify these things stop and think about what you just clicked on to get to that sign-in page. If you’re suspicious, don’t continue. If you have any questions or concerns related to the security of anything your receive in your Centralia inbox, please contact someone in the Technology Department immediately or open a Technology Work Order. 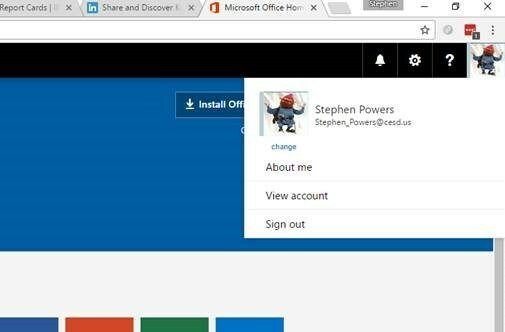 How about personalizing your computer and Office 365 account? 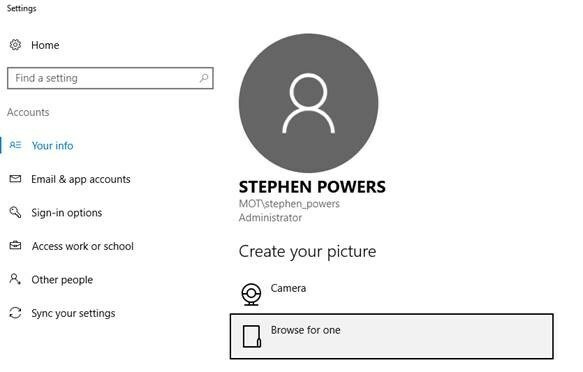 Your picture is associated with your user account in Windows 10, so you’ll see it whenever you sign in to your PC and on Start. 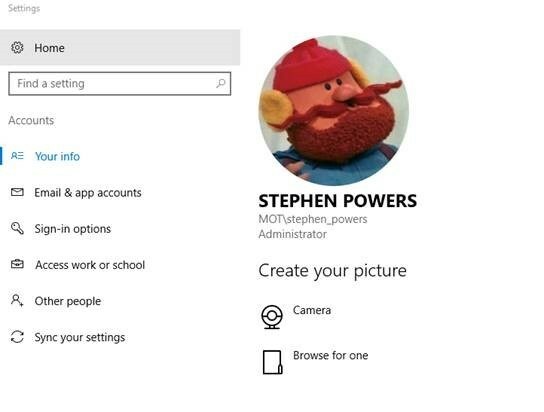 Open the start menu, click on your account in the upper left and choose “Change account settings”. Click on “Browse for one” under “Create your picture” on the right side. 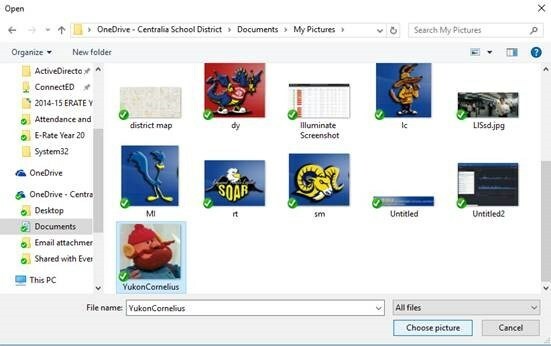 Navigate to and select the image you want, click on “Choose picture” and that picture will now become your profile picture! Now this will only apply locally to your computer. If you’d like this image to appear in Office 365 that’s just a couple more steps. Log in to https://portal.office.com and click on your image in the upper right hand corner of the window and select “change”. A new window will pop up asking you to select the file. Browse and select picture you’d like to use just like in the previous steps. 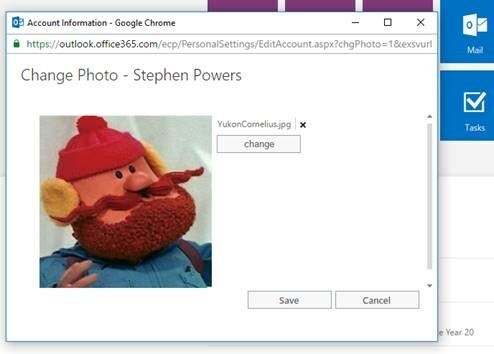 Select “Save” and that picture will now become your profile for all of your Office 365 apps. Hopefully this will help some of you make your computer and Office profile feel a little more personal and fun! Today is the first of what will be quick tech help tips that we’ll be sending out every other Tuesday. To get things rolling I just want to remind everyone of the importance of shutting down your computers, especially if you are using one of the new Surface Books. Makes sure unused programs are not still running in the background consuming resources. Gives you the opportunity to install updates before shutting down ensuring your computer is always up to date and protected. For those of you with Surface Books just closing the lid is not actually shutting it down, this either puts it in “sleep mode” or “hibernation”. Both of these use less power and increase battery life but they do not help with shutting off apps to free up resources or the problem with the updates. Additionally they do sometimes have trouble waking from hibernation mode. As such we recommend that you shut down the Surface Books prior to closing the lid and always choosing “Install Updates” if it’s presented as an option. As always if you have any questions, please feel free to contact anyone in the Technology Department for assistance.